This is a tutorial on how to block your hand knit triangle shawls. I use blocking wires and a spin dryer but you can block any shawl with the materials you have on hand without having to invest extra money in shawl blocking equipment. This tutorial will teach you how to quickly block your lovely hand knit shawls regardless of what materials you have on hand. 1. Soak your hand knit shawl in room temperature water for about 20 minutes. Optional: Add Euclan or other Wool Wash. I’m a big fan of Euclan. The wool wash coats the knit in lanolin which protects your wool and repels stains to a certain degree, plus it smells nice. 2. Remove excess water from your shawl. I use a nifty device called a Spin Dryer (amazon link here) because I’m always blocking something. I also use it for spinning out newly dyed yarn or fiber. You don’t have to spend money on something to get the extra water out of your shawl, you can gently press the water out by rolling up the shawl in a towel and pressing to remove water. Be sure you don’t wring the wool because that can damage your knitting! Optional: You can wring water out of your shawl using a washing machine on the spin setting. Be very careful to ensure that the shawl is not caught on the agitator in any way because the agitation will cause felting under the right circumstances. 3. 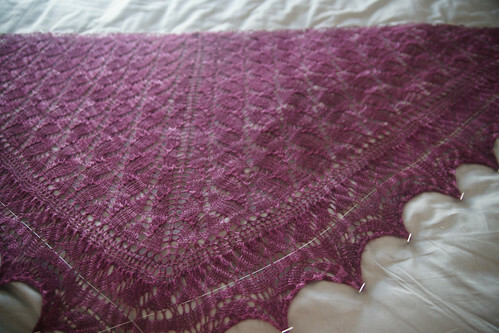 Plan how you’re going to block your shawl. 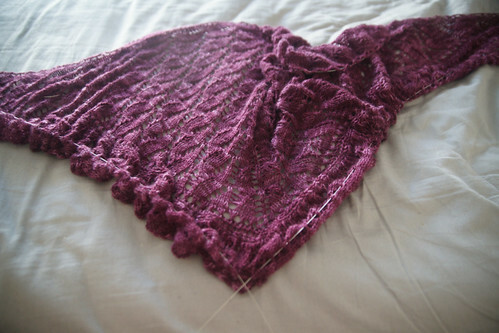 I use Lace Blocking Wires from Inspinknity and pin the shawl on my own bed. In the past I’ve used yarn run through the eyelets on the edges of the shawl with a yard stick and pinned out on my guest bed. I’ve also tried blocking on covered cardboard and foam blocks. I like pinning on an (empty) bed and if you use yarn to stabilize the edges this costs you nothing and you can start immediately. Over time I’ve acquired different tools for making blocking efficient and so the photos show my blocking wires and I briefly discuss the techniques that work best for me. 4. 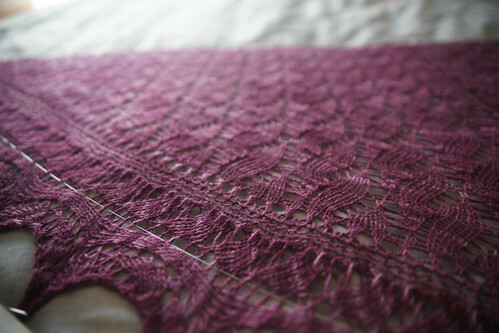 Thread the edges of your lace shawl. I find this is easiest when you use flexible blocking wires. 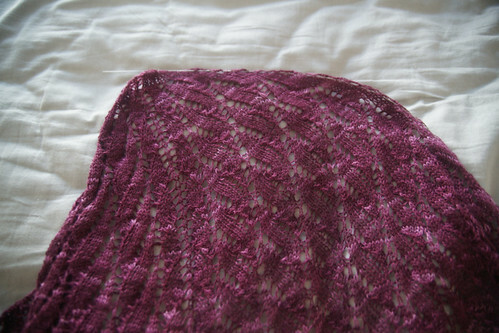 I weave the edge of the blocking wire up and down through the eyelets along the border of the shawl. You may also use yarn for this purpose, using a blunt edge darning needle. I find the wires work a little better but yarn is a no cost solution. Make certain you don’t combine like with like when you’re choosing a yarn for threading through the eyelet edges. If you knit with a wool yarn and you use a wool yarn to block your edges straight the wool fibers will be attracted to each other and you’ll have wool from your blocking yarn stuck in your shawl. This is not a good look. I have used acrylic and cottons when blocking wool shawls with no problems. 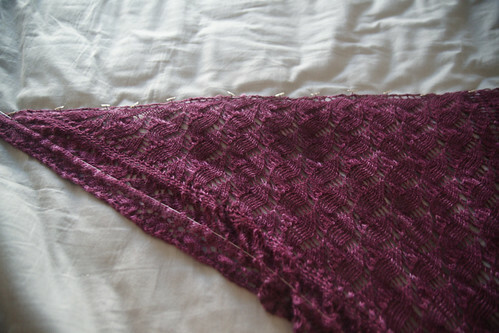 This is what the shawl looks like when I’ve added the blocking wires to all three edges. 5. Begin pinning out your edges in a straight line. Some people do this with a yardstick at the edge or on a specially marked blocking surface. Bending over hurts my back and I’m cheap so I block on my husband’s side of our bed. I have tried many different surfaces for blocking and a bed is the easiest and cheapest surface. I turn on a rotating fan and close the door to the room with the blocking shawl and my shawls are completely dry within four hours of blocking, plus it’s on my husband’s side of the bed so it’s always fun to hear him grumble about pins and wet wool in his space. I tell him he must suffer for my art and eat a brownie. This makes me feel superior. 6. Once you’ve pinned out the long edge begin pinning out the shawl points. Different people have different methods for varying levels of precision when pinning out the points of triangle shawls. I eyeball it and adjust the pins. The best way to adjust the pins is to STOP what you’re doing, take a step back and have a look at how the shawl is laying flat on the blocking surface. I turn my body so that I’m facing the edge and look closely at what I’ve blocked. 7. Adjust pins on all sides as needed. Do exactly as I said above, pin out the shawl, STOP, take a step back and look at what you’ve done. Another trick is to take a photo (I usually but not always stand on a step stool to get a photo) and look at the photo to correct crookedly pinned edges. 8. Turn on oscillating fan, aim it at shawl, close the door and come back in 4 hours. Your shawl should be dry if you’ve used a lace or a sock weight yarn. I test the shawl with the palm of my hand to see if everything feels dry. If you remove the pins from the shawl before it’s completely dry the pinned edges won’t look as crisp and the shawl could wrinkle if you fold it in any way. That’s it! You’ve just read my tutorial on how to Block Hand Knit Triangle Lace Shawls and if you’ve followed along your shawl is done and you feel confident about how awesome you are. Go have some chocolate. Now. 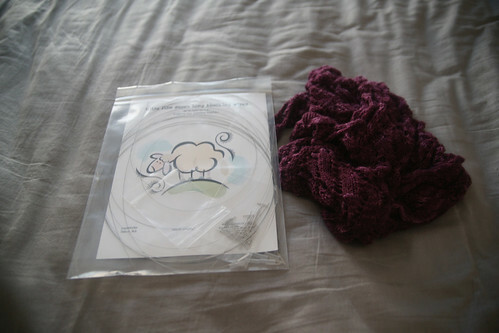 My new favorite knitting accessory is the Blocking Wires sold by Inspinknity. They are very easy to use and help me pin very precisely when I’m blocking my lace shawl samples. I like the Inspinknity wires so much I blocked three shawls in one day! I’m not a paid endorser, I just love Rachel’s wires. Click to buy your own Inspinknity Lace Blocking Kits Here. Interested in buying Michelle’s knitting patterns? Visit her online shop, ravelry shop, or etsy shop to buy now. Each pattern purchased helps keep the lights on and gives Michelle time and resources to write more about knitting. The knitting pattern for the shawl featured in this tutorial may be purchased here. I totally agree on the fan. Even though I’m generally blocking on the spare bed, I’m impatient to see how things turn out. 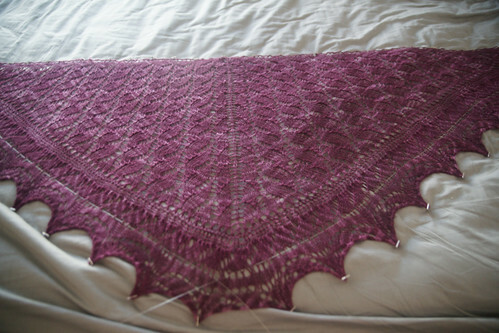 Now I must go get my pink shawl out of the sink & begin the blocking magic!